Your ‘about us’ page might not seem like an important feature on your site, but it is actually an essential part of property marketing. After all, you’ve got dedicated pages for your properties and your services – but then again, so have your competitors. This is where a well-written ‘about us’ section can give you the edge that you need to win those all-important customers. Whether your target customer is a student choosing their university accommodation, or a family looking for an upgrade on their current home, your business has to resonate with them, otherwise they could easily move on to a competitor that has already established itself as a more trustworthy provider. Your ‘about us’ page is where you tell users how you work as a business and why they should choose you over a different company. There are a few essential things to consider if you want your ‘about us’ page to turn users who are considering your properties into customers who have decided on your brand. There is nothing wrong with telling users how great you are. In fact, the purpose of your website is to urge them towards a purchase decision, but make sure you’re giving them relevant facts that present you as competent and trustworthy. People who are visiting your site aren’t stupid; they probably landed on your site in the first place through a search engine, and they can use that very same search engine to fact-check any of your claims. Let’s say, for example, that your company has won major industry awards. This is something to shout about, but exaggerating how many awards you’ve won will tell users that your business isn’t trustworthy – not ideal if you’re trying to market properties. Even if you are reliable, your reputation will be damaged, so making sure that you remain honest on your ‘about us’ page is the ideal way to establish your business as a trustworthy option for users. Choosing the right tone of voice for your property business is essential to building your brand, and you have to make sure that your messaging is prevalent throughout your communications. Everything – from your brochures through to your ‘about us’ page – tells your audience what you’re like to work with. When you’re establishing your business’s tone of voice, it’s vital that you know exactly who you’re talking to. Understanding your target audience and how to communicate with them will dramatically improve your chances of convincing those users to convert. If you’re a student-housing provider, for example, then you should position yourself as a fun brand that is dedicated to creating the best uni experience for all types of students, from the free-spirited to the more serious and scholarly. Consumers don’t connect with faceless businesses; they want to feel like they are receiving personal experiences. Directly addressing your reader will ensure that they feel, from the very beginning of their experience with your organisation, that you genuinely care about helping them to solve their predicament. Not only does speaking in the third person give your business a sense of self-importance, but it also tells your readers that you aren’t approachable. Think about it: you wouldn’t want to make an enquiry with ‘Mega-Corp International Conglomerate Limited’, because it’s just too intimidating. When you write in the first person and you address your reader directly, you’re showing them that your organisation is ultimately comprised of human beings, that you understand their needs, and that you’re dedicated to providing the perfect property solution to meet their needs. Your brand manager will spend time and money honing your company values and making sure that your services reflect how you want your business to be seen. 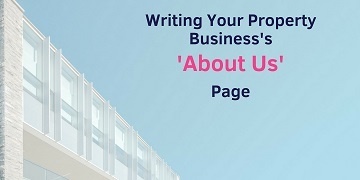 Your ‘about us’ page is the perfect place to put your values into writing, because telling your audience how you work, what you aim to achieve, and what you want your customers to think is a direct way to tell them if your services are compatible with their needs. Ensure that you keep your ‘about us’ page up to date with relevant information, because your values will inevitably change as your business grows, and expressing outdated principles could result in your services appealing to the wrong target audience. Whether you’re trying to nail your property business’s tone of voice or you need a hand in structuring a highly targeted campaign, our expert team of property marketers can put together winning strategies to get your business noticed.